This walk: 2013-5-16. Bluebells, hut circle, triangulation pillar, Hawks Tor, Huxton Farm boundary marker, WW2 anti-aircraft radar station, Beatland Corner cross. Link to Google Satellite view of the area - the car park is in the centre of the image, 1/5th of the distance up from the bottom edge. 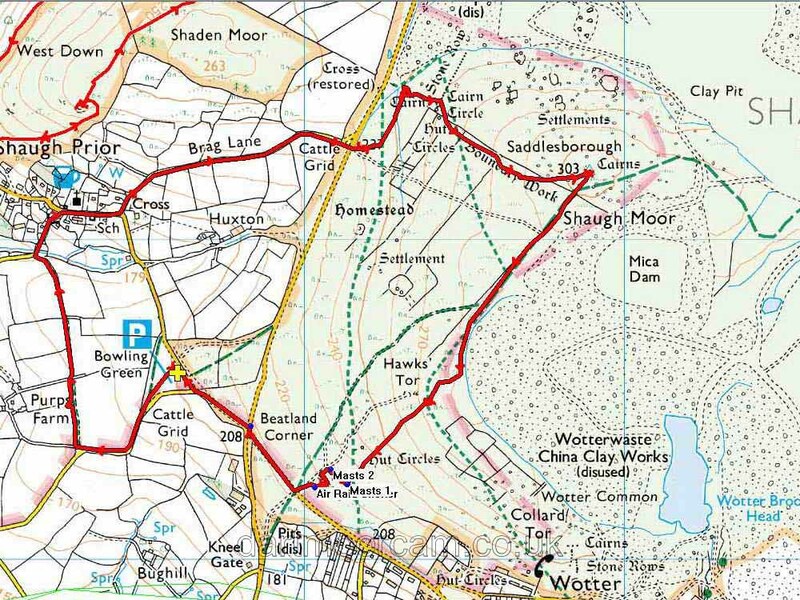 This walk was a repeat of that made on 6th March 2013. Hut circle on Shaugh Moor. Zoomed view of the two tors. A view from the triangulation pillar looking eastwards. The distinctive Hawks Tor, SX 553 625: Staddon Heights, Laira Bridge across the River Plym, Plymouth Sound and the Breakwater are all visible. Another view of the tor with a marker stone. Zoomed view to Bickleigh viaduct: this appears to have old, short piers alongside as have a few bridges in this area arising from Brunel's original viaducts having been rebuilt a little higher. One of possibly four markers for Huxton Farm ..... According to Dave Brewer (2002) Dartmoor Boundary Markers, Halsgrove, p.233, there are four of these markers, all associated with reaves and field boundaries. They are thought to relate to use of the land by Huxton Farm (which is just across the road from this area (SX 5479 6302). SX 55136 62233 - RAF Hawks Tor: World War 2 Chain Home Low Radar Station (for detecting low flying aircraft) - be sure to click the Related Text link to see the story about this site (SX 55078 62280). The concrete bases are the footings of masts. Clicking the Aerial Photograph link reveals that there were two of the these masts plus other structures in the area. It must have been quite a large site. Dartmoor Magazine, Autumn 2009, Issue 96, pages 42-43 describes the site as a Chain Home site without the low or extra-low flying detection capability - this to provide long range cover for Plymouth, Exeter and the south coasts of Devon and Cornwall. It opened in May 1940 and was closed in 1943. Click here for a Google map of the area - it is a better view. Air raid shelter at SX 55033 62225. Looking down into the shelter. Showing the location of the stone at the cross-roads. This walk was reached by driving from Roborough, to Bickleigh, turning right after the barracks, over a very narrow bridge (7 ft), passing two roads on the left, on to a triangular road island, turn left to Beatland Corner, turn left and park just after a small road on the left, at the P symbol / yellow cross on the map. Distance - 7.46 km / 4.64 miles.